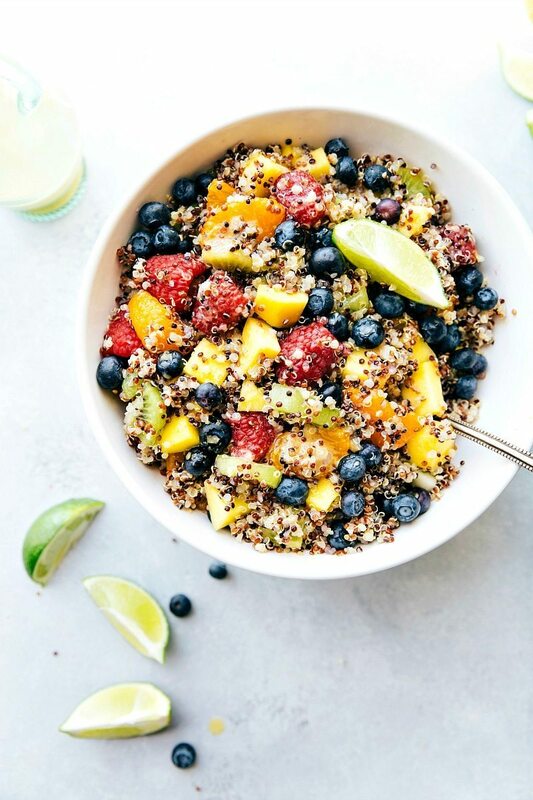 Fresh fruit, tri-colored quinoa, and a tangy citrus dressing = pure summer bliss in a bowl. 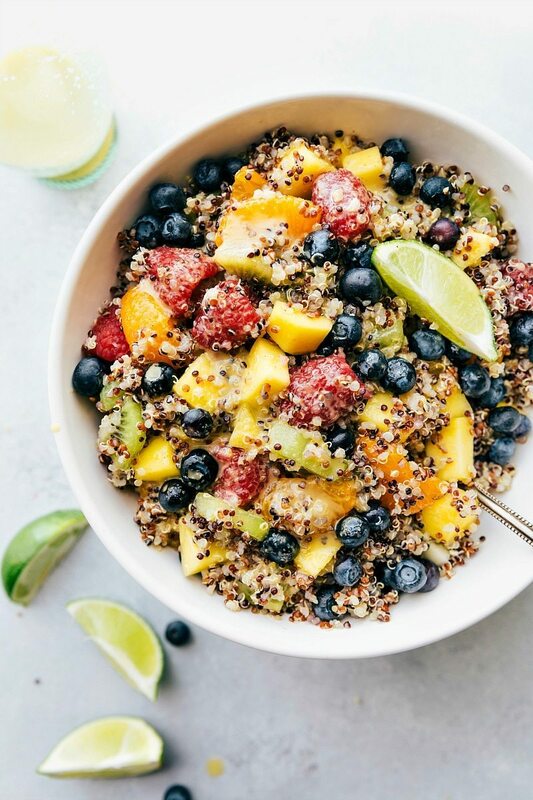 I love a good fruit salad, but adding a dressing and quinoa to a fruit salad has quickly become a new staple in my home. The quinoa adds tons of protein leaving this salad surprisingly filling. 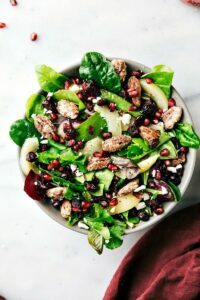 While it probably won’t stand on it’s own for a meal, serving it with some grilled chicken or steak is honestly one of the best summer meals ever — fresh, light, healthy, and packed with flavor! 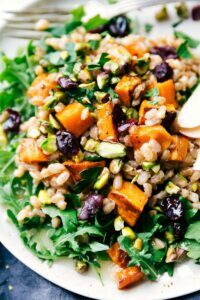 This salad is highly customizable; pretty much whatever berry or chopped fruit you want will go well with the quinoa and dressing. 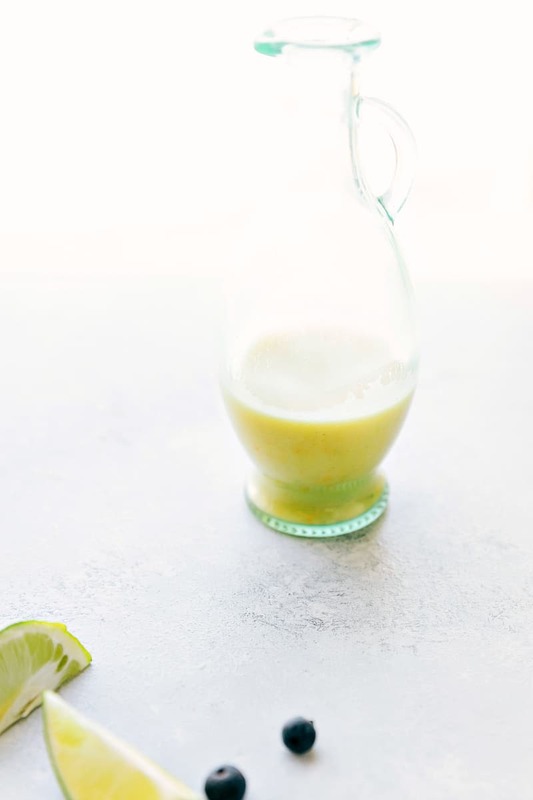 The dressing is subtle, tangy, tasty, and healthy; plus it is super quick and easy to whip together. This salad doesn’t take too much prep time because the only fruit you need to cut is the kiwi and mango; the oranges just get drained and blueberries + raspberries just need a quick wash + dry. Once you try it just once, it will become a salad you’ll be craving all summer long!! Prepare the fruits: Peel and chop the mango. Wash the raspberries. Peel the kiwis and slice or chop. Drain the mandarin oranges. Wash and dry the blueberries. 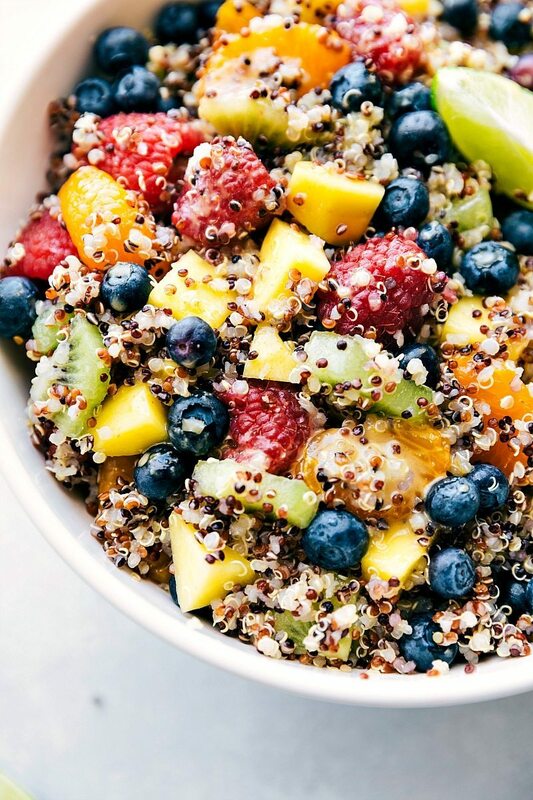 Allow the quinoa to cool completely and add all the fruits. Gently mix together. Pour the dressing over the salad and mix. If desired squeeze a wedge of lime over the salad. Store this salad in the fridge. Looks so bright and colorful! What part of the grocery store does one buy quinoa? I think it depends on what store. 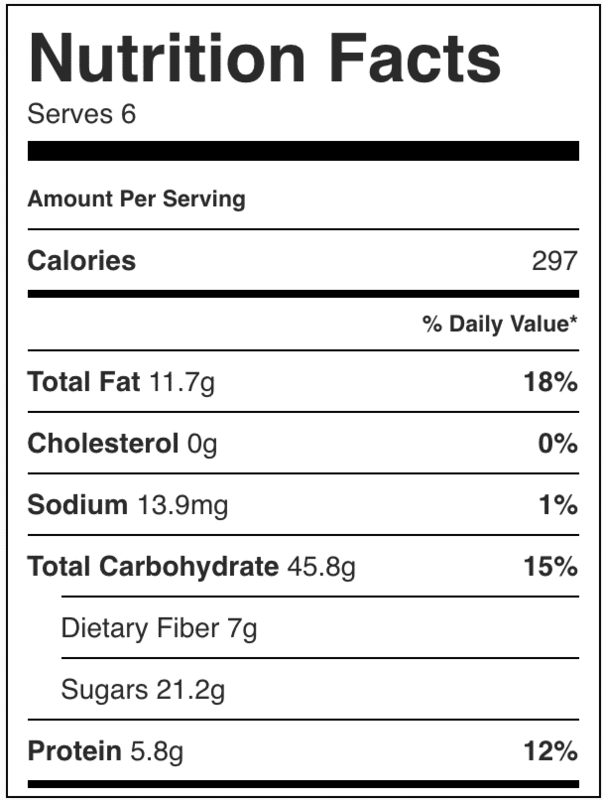 Most often I’ve found it in the healthy food sections or gluten free sections. Occasionally I will buy it in bulk from Sam’s Club because it is cheaper that way. For tri-color quinoa, I recommend Bob’s Red Mill – that’s my favorite! Thanks Megan! I hope you do too, it’s so good! You photograph the most beautiful salads, Chelsea! 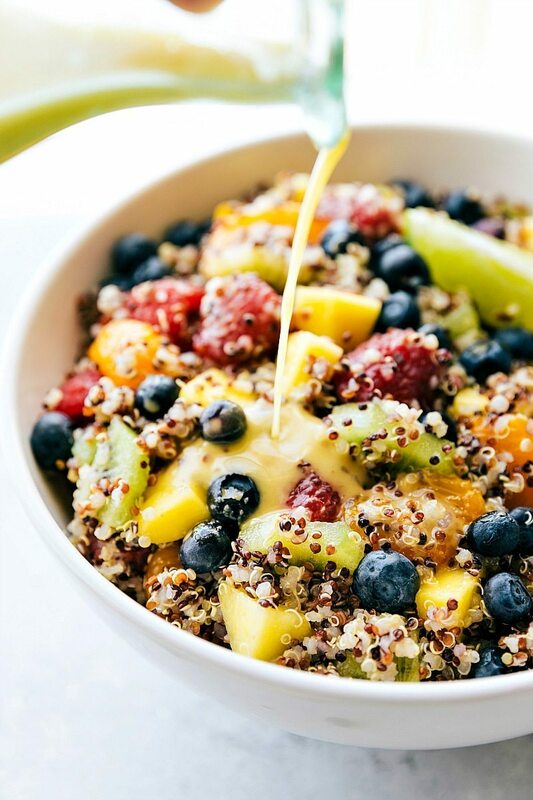 I love the quinoa in this fruity salad and I especially love the dressing! It’s perfect for Spring! Pinned! You are so sweet! Thank you Justine 🙂 thanks for the pin! Hope you are having a great weekend! This salad looks so fresh and bright, Chelsea…perfect for spring! Gorgeous! Love all the colors! Can’t wait for summer! This looks AMAZING!! All of your photographs are so beautiful!! And definitely inspiring to eat healthy! Lovely!! And I hear ya on not being able to wait for warmer weather!! 🙂 …so ready for summer! Beautiful salad, love the color! Yum! 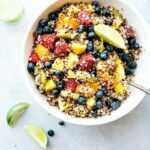 I love fruit salad and I love the idea of quinoa in this one! Pinning for later! Chelsea, you are so fabulous at making salads. The presentation is beautiful!! Really. I have never tried the tri-colored quinoa. I bought a bag of the red, and I didn’t like it much, usually stick to the right. I just need to experiment more with the red I guess 😉 The tri-colored will be the next bag I buy. Thanks for the salad inspiration. Pinned for later. Happy Monday! You are the sweetest! Thank you Kelly! Hope you had a wonderful weekend! I’m not totally on the quinoa train either yet. I want to be, just don’t make it nearly enough. 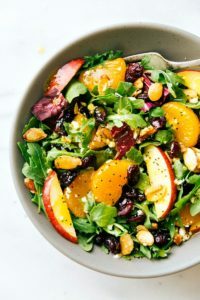 This salad looks so vibrant and screams summer warm weather to me! I am in love with this salad, Chelsea! Quinoa is one of my favorite grains to cook with. It’s basically a staple in my house! Thanks so much for sharing at Marvelous Mondays. Pinned and sharing on G+! How pretty! Love this salad, Chelsea! My kids were easier to convince than my husband when it came to quinoa. I still don’t think he’s on board! LOL. Pinned! I really like quinoa but with dressing or some flavour. I love the colours in your salad and the dressing sounds nice and tangy! 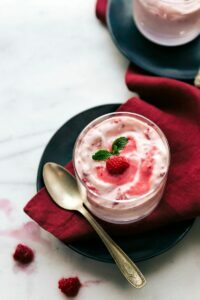 This looks amazing, and healthy too! It is our Spotlight of the Week 🙂 Thanks so much for sharing at Mix it up Monday! I adore all of your delicious salads, but this one is the best so far!! 🙂 So much color and goodness in one bowl! Pinned!